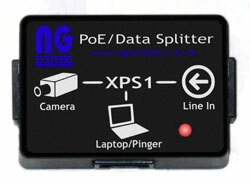 The NG Systems PoE/Data Splitter (XPS1) is an installation device which allows PoE power to be delivered to a camera whilst allowing a direct connection to a laptop or other device (e.g. Pinger). This significantly simplifies camera configuration or lens focusing and shortens installation time. Simply connect the PoE-carrying network cable, laptop/Pinger and camera into the XPS1. 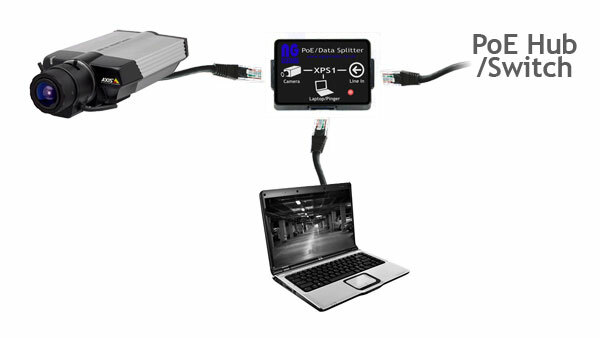 The eliminates the need for a local power supply for the camera and also allows precise focusing/angling adjustments of the IP camera at its final installation site. A high-intensity LED lights up on the XPS1 once a PoE-camera is attached and has started to draw power enabling rapid troubleshooting of an installation.